Sport Law focuses on helping sports organizations with their legal, marketing and strategic needs and it was critical for them to have a better way to promote their services. Their website was dated and lacked ease of use and did not encourage users to take any type of actions. The original Sport Law website was built on Wordpress, but was dated and lacked focus for users. When you would arrive on the page there was no clear direction or action that a user could take and no real clear call to action. This is a missed opportunity for getting new business and we needed to make sure that we were bold in our delivery of services they offer and how to contact them. User navigation was one of the core components when planning the website so making the funnel easy to allow them to find what they may need was super critical. The website has information and resources dating back for years and the Sport Law team wanted to make sure that the content was improved in the way it was delivered on the website both for users and for the team to manage. We worked with the team to ensure categories and tags were properly utilized. Integrated a more intuitive use of these items from back end allowing certain information to show up on certain sidebars on specific pages. Also a more advanced search functionality was added to ensure readers could find the most relevant information to their search. The group offers multiple webinars each year that can benefit their contacts. 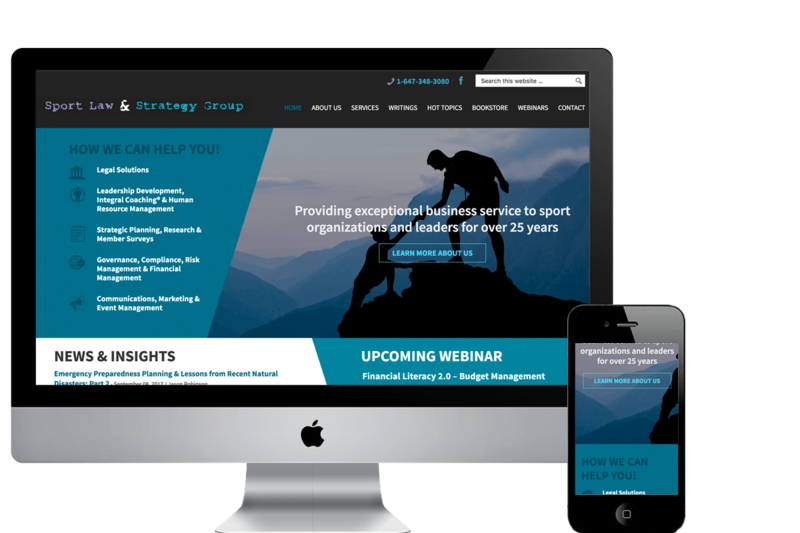 They wanted an improved way of showcasing their webinars so that interested persons could sign up with ease. 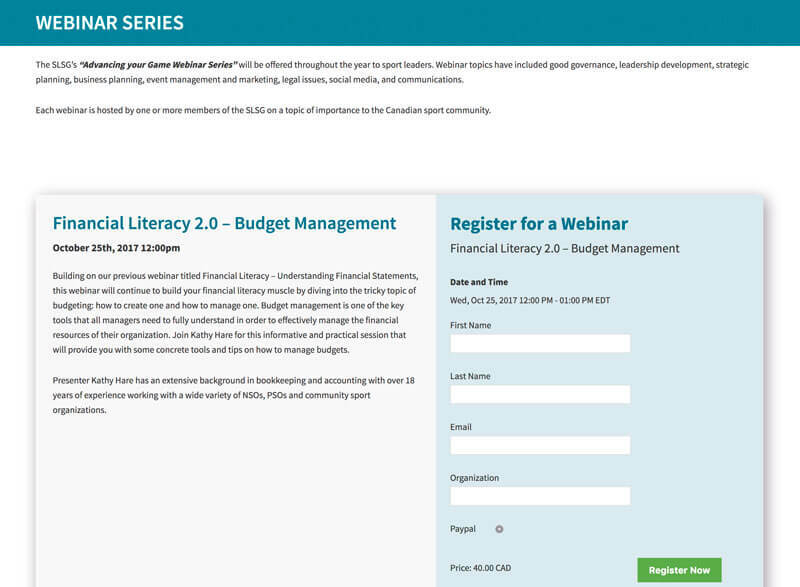 The webinar page is created using Advanced Custom Fields Pro so each text area just needs to be edited. They can select whether a webinar is "Featured" or not - if it is it will look like the image above, if it is not featured then it will just be text below any featured webinar. This page is very flexible and easy to maintain. They utilize Go To Webinar to manage the registration process. The prior version of the website offered no engagement, too much content and no funnels or call to actions to encourage users to take a specific action on the website. It left confusion as to the services the group provided and had no real visual impact or clarity. With the Wordpress redesign we gave them an easy to use website that has a clear focus as to who they are what they do! The home page offers the most important and updated information needed and the interior pages offer custom sidebars based on the content delivered on the page. "We had a social gathering with a bunch of our important clients on Wednesday and showed off our new site - got some great comments! We officially 'launch' next week as we celebrate our 25th anniversary."